10. Shelby Mustang GT500 | What Car? This is the 540bhp Shelby Mustang GT500 a car that looks so good we feel compelled to write about it, even if it's unlikely to be seen on a British road. 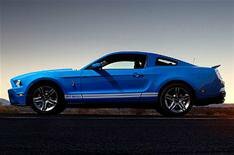 The GT500 goes on sale in the US this spring, and is powered by a supercharged 540bhp 5.4-litre V8 petrol engine with 510lb-ft of pulling power. That equates to a limited top speed of 155mph, and 0-60mph in less than 4.5 seconds. High-performance features include a short-throw six-speed manual gearbox, a twin-disc clutch and limited-slip differential. Aerodynamic enhancements over the previous model also add downforce, while the suspension has been enhanced to sharpen the handling. However, it's not all about performance Ford says the new engine is also more efficient. It's available as a coupe and convertible and, yes, those racing stripes are (in our opinion) a must-have accessory.